Chinese military personnel departed a naval base in Zhanjiang on Tuesday, destined for Beijing’s new base in the East African country of Djibouti. China started construction on the base, which it officially calls a “logistics facility,” in February 2016, and it has not said when the base might formally start operations. The Chinese navy has been assisting anti-piracy efforts in the Gulf of Aden and peacekeeping missions in Africa for some time, but the base in Djibouti will be Beijing’s first such facility overseas. 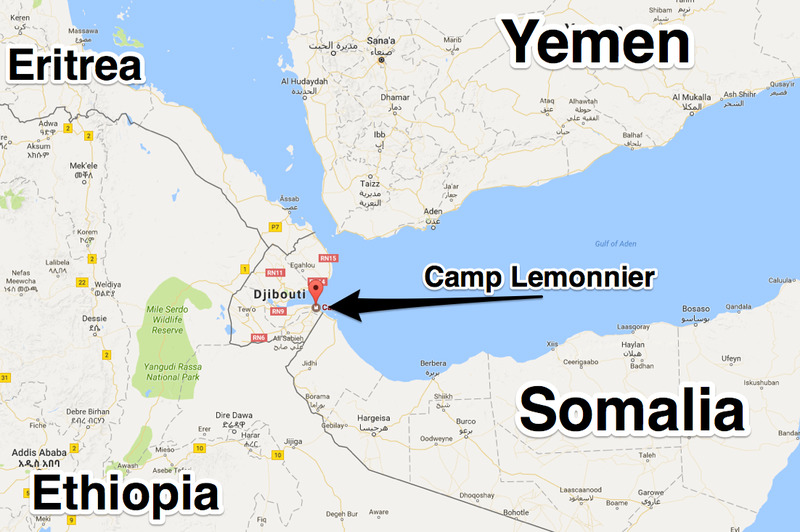 Djibouti, home to about 800,000 people, also has French and Japanese troops, is strategically located in the Horn of Africa, sitting on the Bab el-Mandeb Strait, a gateway to Egypt’s Suez Canal and one of the world’s busiest shipping corridors. 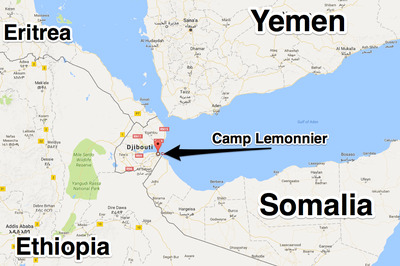 And the new Chinese base is just a few miles from Camp Lemonnier, a major US special-operations outpost. “We’ve never had a base of, let’s just say a peer competitor, as close as this one happens to be,” US Africom Command chief Marine Gen. Thomas Waldhauser said in March. “Yes, there are some very significant operational security concerns, and I think that our base there is significant to US because it’s not only AFRICOM that utilises” it, Waldhauser said at the time. US Central Command, which operates in the Middle East, Joint Special Operations Command, and European Command are active there as well. The base in Djibouti is just one project China has undertaken in the East African country. Chinese banks have funded at least 14 infrastructure projects in the country, including a railway connecting Djibouti and Ethiopia, valued at $US14.4 billion. Beijing has made similar investments throughout the continent. US officials, as well as countries in the region, have expressed concern about the capabilities the new base gives Beijing and what it may augur about Chinese ambitions abroad. “China most likely will seek to establish additional military bases in countries with which it has a longstanding friendly relationship and similar strategic interests, such as Pakistan, and in which there is a precedent for hosting foreign militaries,” the report said. Other countries in South Asia — India in particular — are concerned about Chinese activity in the region and see the Djibouti base as another part of Beijing’s “string of pearls,” which refers to Chinese facilities and alliances among Indian Ocean countries, including Bangladesh, Myanmar, and Sri Lanka. China is already heavily involved in the Pakistan port of Gwadar and is building a network of roads and power plants under a project known as China-Pakistan Economic Corridor. Civilian ports that Beijing has helped build in places like Pakistan and Sri Lanka can also receive naval vessels, fuelling suspicions that China aims to deepen its strategic capacities in the region. India sees the Djibouti base as a potential hub for Chinese surveillance operations and has objected to China’s planned shipping network with Pakistan, saying it cuts through disputed parts of Kashmir. Analysts have also said New Delhi is worried by Chinese submarines, warships, and tankers present in the Indian Ocean. India has tracked Chinese submarines entering the Indian Ocean since 2013, and a 2015 US Defence Department report also confirmed that Chinese attack and missile submarines were operating in the Indian Ocean. “If I were Indian I would be very worried about what China is up to in Djibouti,” a Western diplomat briefed on Chinese plans said in March 2016. Other countries in the region have looked for ways to balance against what is seen as China’s growing influence. Australia and India, along with countries like Vietnam and Japan, have considered informal alliances to bolster regional security in light of growing Chinese influence and doubts about US commitment under President Donald Trump. This week, the Indian, Japanese, and US navies started the Malabar 2017 exercise in the Bay of Bengal. The exercise, which this year features three aircraft carriers, is seen by some as a effort to check Chinese activity in the region.